It’s time for the individual galettes recipe! Big things going on around here, and sometimes when I’m in the midst of getting my near-future life organized, my present-day life takes a hit. I should (but I won’t) hesitate to call these “individual” desserts; they are, in truth, made out of a regular-sized galette dough cut into fourths. A normal galette allegedly yields you eight servings, so technically my individual galettes would serve two; anyone who eats these would argue, while holding their plate as far away from interlopers as possible, that they only serve one. And so they shall be called individual galettes. Which are the size of salad plates. But so what, right? It’s summer, and these things are as practical as they are delicious. When fully cooled to room temperature, you could actually hold them very much like a plate, and eat them. Less plate use equals less dishes to clean up (or throw away, if you’re the disposable type), which also equals less work. As if that weren’t fun enough, they’re shaped in such a way that their crusts stay raised as the fruit cooks down, thus keeping any ice cream you may add to it within the confines of the dessert rather than oozing out. Don’t like ice cream and pie mixed together, like me and my sister (who throw it on the side)? Perfect; the crust does double duty by keeping things out, which means you can set your ice cream on the plate with minimal contact to the galette. They are very much like the perfect dessert for summer. Especially if, as I’ve said before, you’re like me and would much rather roll out dough into super random circles, fold them, and call it “rustic” rather than fiddle about with actual pie-making. I love pie, don’t get me wrong, but I also love enjoying summer without fits of mini-rage brought on by meticulous folding of dough edges. You can (and should!) use any fruit for this you want to: I did peach and strawberry for you here because it felt right for a late-May celebration, but mix it up as the summer goes on. I’ve made mixed berry, spiced pear, blueberry, apricot, you name it; it’s hard to get these wrong. Think of the measurements for sugar (and maybe for cornstarch) as a guideline rather than a strict rule; the sugar completely depends on the fruit and how sweet it is to begin with, and the cornstarch I alter depending on how crazy juicy the fruit I’m working with gets. 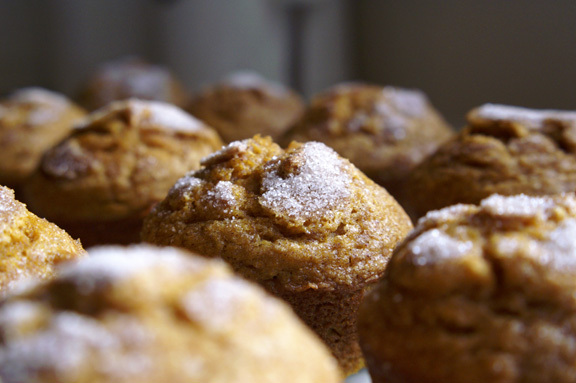 And it’s always a good idea to add a squeeze of 1/2 lemon to each batch, because it keeps everything fresh and bright. The crust is the best I’ve worked with, perhaps ever. It’s one of my own lazy creations, but I can’t imagine that it is original to me or that most galette doughs are much different. I like this particular one as it browns nicely, is delicate but not overly so, and pliable and forgiving to work with. It also goes a long way to keep the fruit trapped inside without leaking, keeping most of those dark fruit juice puddles around your galettes from happening. Summer, people. It’s happening. I have a few things I need to tell you about. Hopefully they’ll be exciting. This one is sort of original, but based on all the times I’ve made galettes before, and it’s impossible to link you to my brain (although I would if I could). I think the last time I made one was last year, and it was Natalie’s, which was delicious. You can find that one right here. *this is a double batch of dough, but it’s easy to make in the food processor, even if you just have a 12-cup like mine (versus the more-giant 14 or 16-cup capacity ones). If you’re just wanting 1 normal galette or 4 individuals, cut the dough recipe in half. **I’ll say it again: these are close approximations, because this is based largely on how in season and ripe your fruit of choice is. You’ll want to gauge this for yourself, but I think this is a good amount for the fruits used here, or most ripe, ready-to-go summer fruit. The cornstarch just helps to thicken the juice, and since these are particularly juicy fruits, this is the amount I use. I like it “thickened” but closer to “juice” than “gel,” if you know what I mean. You do. Let’s proceed. You will need two unlipped baking sheets for this, half-sheet size (so, the big ones). Line both sheets with parchment paper. It is perhaps the only time I’ll ever tell you that baking with two sheets in the oven is okay, and I promise you, it works. Preheat the oven to 350˚F. Arrange the racks into the bottom 1/3 of the oven, one right over the other. Which is just a simple spin in the processor. Combine the flour, sugar, and salt in the bowl of your food processor and pulse a few times to blend. 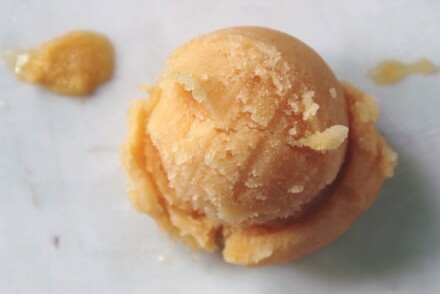 Add half the frozen butter cubes, plus once to flour-coat them, then add the second half. Pulse the entire mixture until crumbs gather which look like damp beach sand and no large butter lumps remain (I take a fork and run through it if I’m unsure). Add the ice water, a tablespoon at a time (and give it a few seconds between each) until the dough starts to form a ball. Remove it from the food processor, press it into a cohesive thing, and divide it in two equal parts. Press those parts into a ball and then flatten them into salad plate-sized disks. Cover each one tightly with plastic wrap and refrigerate at least 2 hours until firm. And please, don’t do this until your crusts are ready for the fruit. You don’t want fruit sitting in sugar, lemon juice, and cornstarch for any length of time because it can get really mushy. Toss it all together right before you add the fruit to the galettes. Add your sliced fruit into two large bowls. Add 2 tablespoons of sugar to each bowl, then 2 teaspoons of cornstarch to each, then squeeze half a lemon over each. Stir together gently to dissolve sugar and cornstarch into the juice. Remove one dough disk from the refrigerator and cut into 4 equal slices (through the middle, so you end up with rounded triangles). Use your fingers to work those into smaller, roundish disks, and roll out between sheets of plastic wrap (so easy!) until they are about 1/8-inch thick. Lift the disk by the bottom sheet of plastic wrap and turn out onto one of your prepared baking sheets. Repeat with the other 3 sections of dough. Working carefully with a large serving spoon, ladle out the prepared fruit on to the center of each dough, using your hand to work it into a little fruit hill, keeping it about an inch from the border. Once this step is finished, begin folding the dough over top the fruit, aligning the fold with where the fruit hill ends. The best tactic here to keep it both elevated and sealed is to pinch the folds together as you do them rather than pressing them down: use both hands to accomplish this, and make sure each fold is sealed. Your end result should look like an unbaked version of what you see above, with the dough hovering over the fruit like a wee fortress. Use a pastry brush to brush the crust with the egg wash so it is covered, then sprinkle with as much sanding sugar as you wish (or in a pinch, use some more granulated sugar; it works just fine). Place that one baking sheet into the top rack of your oven, off to one side (because you don’t want the fruit getting to juicy waiting for the other galettes to be made.) Start your timer for 30 minutes. Proceed with the other fruit and remaining 4 galettes, using the same steps above. When you’re finished preparing those, place that sheet onto the bottom rack of the oven, off to the opposite side as your first one. Note the time you put it in and add the difference to the baking time of this sheet. Check at 30 minutes. Your first one won’t be done, but should be close, and you want to make sure nothing is getting too dark. Switch your sheets at this point, so the first sheet is on the bottom and to the opposite side, and the second sheet is on the top, also on the opposite side. Set your timer for 5-10 more minutes, to get the first ones done, checking every five minutes. Remove the first batch from the oven (which should take a total of 35-40 minutes from start to finish) and add those minutes you noted earlier to the bake time of your second tray; they should (obviously) take the same amount of time from start to finish. That sounds like a big production: it’s not. I’m sure, as usual, I over-explained it, but sometimes when I’m busy making food for parties, I forget things like “hey, there’s still an entire sheet of galettes in the oven.” I just want to make sure you had a reminder, if you are prone to the same. Makes 8 individual galettes or two normal-sized ones. You can store these, but they are best eaten the same day they are made. Leftovers are great for maybe 1-2 days following. Store them tightly sealed in the fridge; I’m not a big “leave the pie out on the counter” person, mostly because ants. They happen. 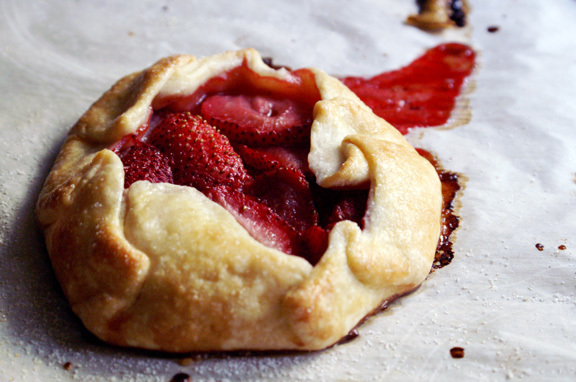 Love these rustic little tarts! Galettes are such a great idea because, like you said, you don’t have to be all perfectionist about it. And who wouldn’t want a dessert all for themselves. Looks so yummy, Shannon! i live with the belief that everyone wants individual desserts when they manage to yield at least two servings. rustic is SO the way to go with pie; it’s my non-talent talking there, because i can’t for the LIFE OF ME make a pie look Martha Stewart-proper, so rustic it is. Individual clearly means no sharing, and I like the idea of not having to share my dessert. I also like the idea of holding these like plate and chowing down, and then licking my fingers clean. These are beautiful, and so much easier than pie. jennie, i know you can get down with a big individual dessert, for sure! they’re sort of the same size as one of those chocolate hazelnut cookies. 🙂 thanks! You won’t find me sharing a whole batch of these (yes, I’d eat all 8 servings, given the chance)! And I’m totally with you on the rustic dough thing – it’s glorious in simplicity and even aesthetics. Well, Ashley, that’s what happens here when I make a whole one versus individual ones: slivers get cut, eaten, then more slivers get knocked off, and i’m all “um, wait…where did the galette go?” whoops. I had a leftover one for breakfast the other day. it was sort of like fruit on toast, right? sort of. What glorious galettes! 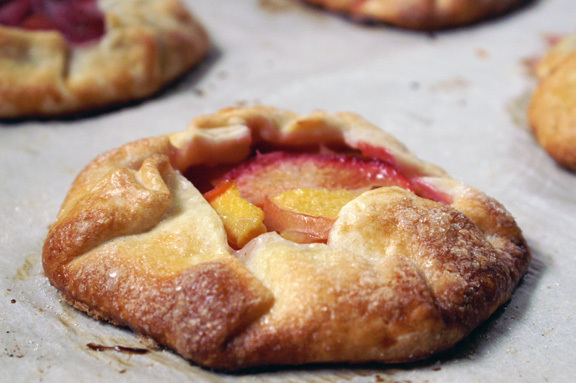 Peach season is just starting here and I can’t wait to bake with summer fruit! To me, summer fruit just BEGS for a rustic presentation. I can practically taste these just by looking at them; they look fantastic. Gorgeous and easy, the perfect combo! My peaches are ready. Please come visit. oh man, texas peaches! that’s your new nickname. and i am totally on my way. so many reasons to come to texas that i need to pick a time of year. 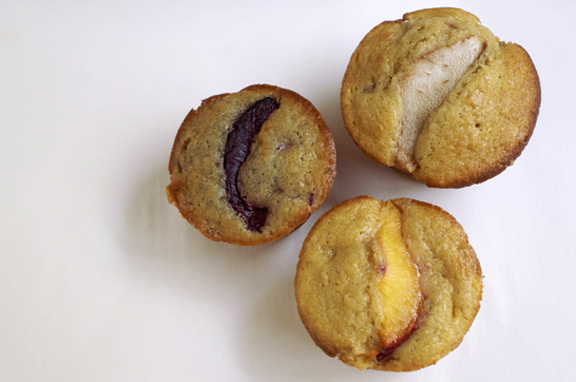 obviously summer since you’re not working and we can bake our faces off, and you have peaches i can frolic through (do you just like, wander around smelling your outside yard? I would), but maybe i’ll come when it’s not yet hot enough to steam my insides like a pork bun. so, now? okay. Looks fantastic as always. Going to have to try this for my next singles game night.